Every Hero deserves some down-time, right? So why not a friendly, weekend geocaching competition? The first team to follow the clues to their conclusion may even find a time capsule buried a century ago. Or perhaps buried gold - the local legends are unclear. What IS clear is that some people in Pinebox want the past to stay buried, while others just want to get there first. This three part modern horror adventure quickly immerses the heroes in a mystery spanning four generations. During the 20 hours (average) of game play, you'll encounter more than a dozen GM characters who will leave you wondering who, if anyone, can be trusted. Cults, curses, ghosts, guardians, magic, monsters - each time you think you've reached the end, you find a new piece of the puzzle raising the stakes even higher. 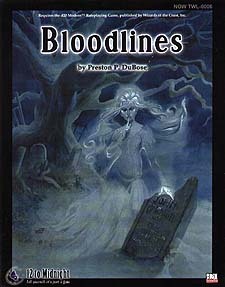 Bloodlines is a complex horror-mystery perfect for experienced GMs ready to scare and challenge their players, featuring 22 player handouts and 8 GM maps.